It’s a new day on Kona and a new bike has greeted us! Meet the Pinarello Bolide TR\TR+, a bike whose starting point was the original Bolide (you know the one that set Kona course record under Cameron Wurf last year). 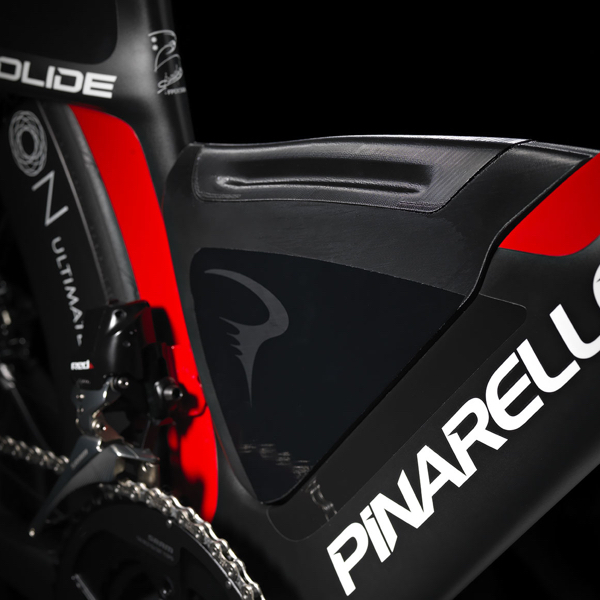 The incredible success of that bike last year (built not for tri but for TT) led Pinarello to see what they could do when they built with triathlon in mind. Improve comfort, handling and stability feeling. 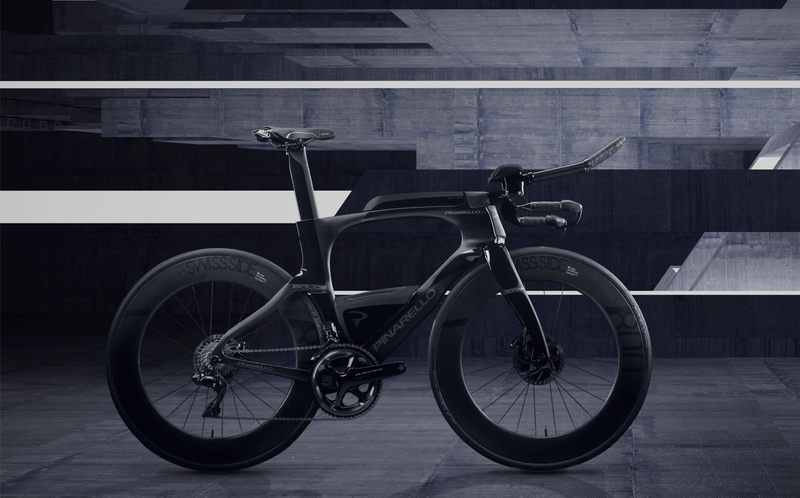 The result is a bike that very much is a Bolide but is built for triathletes. The Bolide TT aerodynamic was used as starting point and as benchmark to design the Bolide TR+ frame shape. UCI limits were tossed so the aero-shape “3:1” norm was not followed. 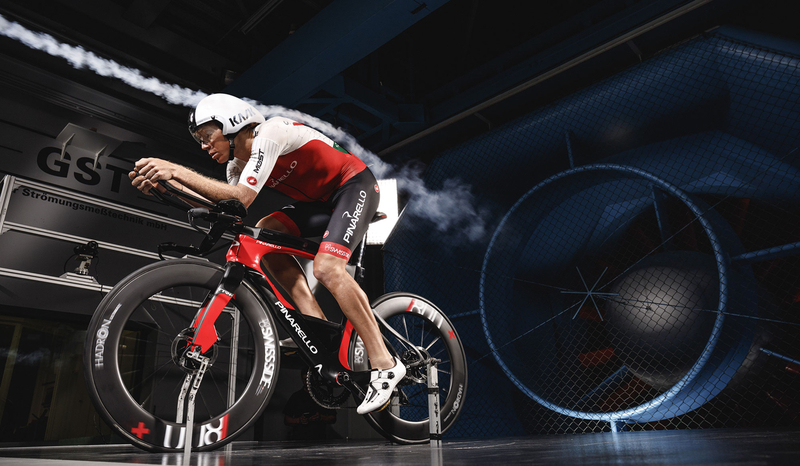 Aerodynamic testing was done with and without a human dummy to get the complete aerodynamic picture. And models were based off of the Kona winds. Being free from the UCI standards meant the fork profile could be considerably lengthened to improve the aerodynamic flow around it. In addition the fork flap design has been revised with the dual objective of integrating the through axle drop out and reducing the aerodynamic drag. The advantage of being able to mount the disc brakes allowed to revise and optimized the monostay. In fact Pinarello no longer need the rim brake integration cover. So the monostay has been redesigned in such a way as to minimize its front surface and ensure an optimal air flow to the rear wheel. The Bolide TR+ is designed to allow a max tire of 700x28mm and a rim width of max 30mm. This ensures the compatibility of the frame with modern Triathlon wheels specifically designed to optimize aerodynamics. In order to satisfy all customer category, Bolide TR will be available in two different construction. The high end version Bolide TR+ will use as main material Torayca T1100G finish. The mid-end version Bolide TR will use T700 UD finish. Both materials ensures the highest tensile strength. This choice contributes to increase the impact strength, to prevent breakages. Torayca T1100G ensure a lighter frame in comparison to T700. 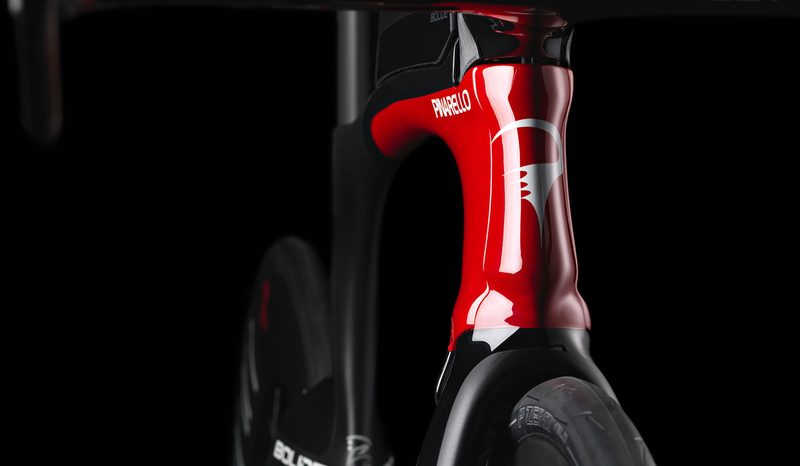 The well known Pinarello asymmetry concept, with down tube moved to the right, allowed them to increase the stiffness due to the shape, recovering that stiffness lost with the usage of less material. Thanks to the highest grade of carbon fiber used (especially higher strength) we were able to get a lighter frame maintaining its strength unchanged. T1100G fibers have been used in the higher stressed areas, in order to take advantage of its incomparable strength. One of the main objectives of the project was to provide the Bolide TR+ with a kit of fuel storages that had the function of satisfying the needs of feeding of the athletes during long races but that did not adversely affect the aerodynamics of the bicycle. Pinarellos research showed that mounting hydration under the aerobar had a negative overall affect. On the top tub is a fuel storage box. It has a rubber membrane on the top were the food can be easily taken in and out. It uses the standard 2 screw bento box design, so can be easily removed. It is completely integrated with the handlebar cover and the shape is designed to reduce the aerodynamic drag. The down tube box is designed to carry food or to carry tools (inner tube, screw driver, tire lever,..) It is fixed at the downtube with 2 screws and can be easily removed and can be replaced by a bottle cage. When installed improves the air flow around the frame. 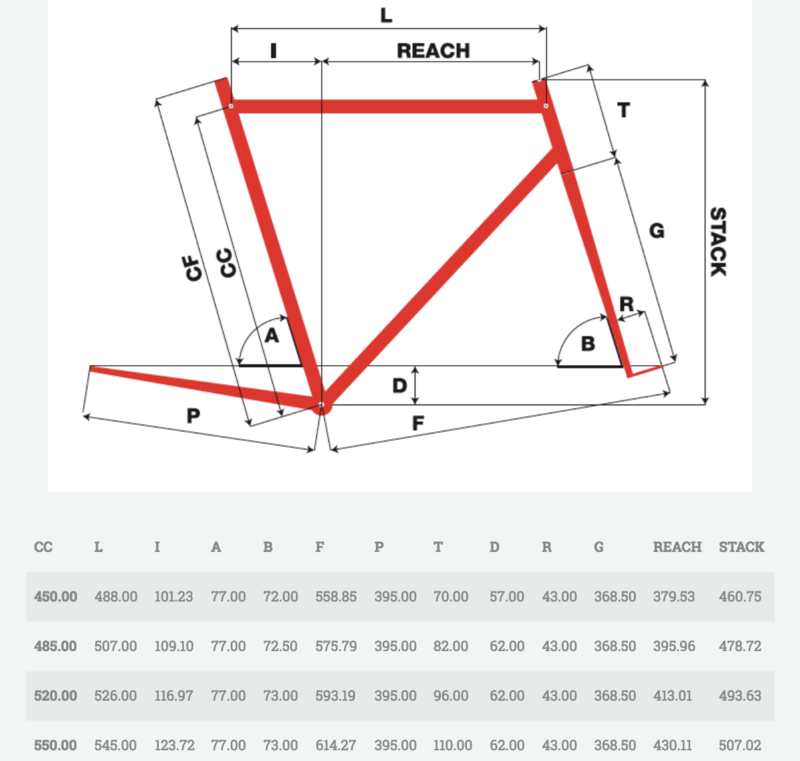 The geometry needs of a time trialist are very different than a triathlete. The starting point for the Bolide TR+ project was to realize that triathlon geometry without distorting the characteristic of speed inherent in the Bolide TT. So the definition of sthe pecific geometry for Bolide TR+ was driven by the research of an optimal rider position that ensure comfort for long distances. The head tube was increased by 35mm in comparison to Bolide TT. this allows you to improve ergonomics and have a more relaxed position on the bike without sacrificing the aerodynamics. In combination with the Aero TT bar which can add 40mm spacers under the extension and + 10mm spacers under the pads, every rider can find his best position or adapt the position to the type of race. A bigger head tube also increases also the rigidity of the bike frame and the overall stability of the head set. The bottom bracket was moved downward by 8mm in comparison to Bolide TT. This improves comfort especially when getting on the saddle. In addition the overall center of mass is downward improving riding stability and aerodynamic efficiency of the bike. The seat tube angle is moved forward to 78°. In combination with the straight seatpost, the position becomes particularly advanced, ensuring the best thrust on the pedals. Two other seatpost versions will be available with retractions of -25mm and -50mm. In this way, every athletes can find the most congenial position for his ride. We are still waiting on full details on pricing and kit options. For now we do know there will be 4 colors available. It’s always tough to beat a champion. But when you consider that last year’s Bolide was never designed specifically for long course triathlon racing, it makes Wurf’s accomplishment all the more impressive. We know that Pinarello could have gone with a more aggressive design, something completely clean slate. But we have to agree that starting with the Bolide and iterating makes a whole lot more sense. With the changes of the Bolide TR we are really excited to see what Wurf can accomplish not only on the bike, but with its more tri friendly geometry, after T2 as well. Make sure to watch the coverage this weekend to see the Bolide TR up close and personal. And stay tuned to AeroGeeks.com for our continued Kona coverage!